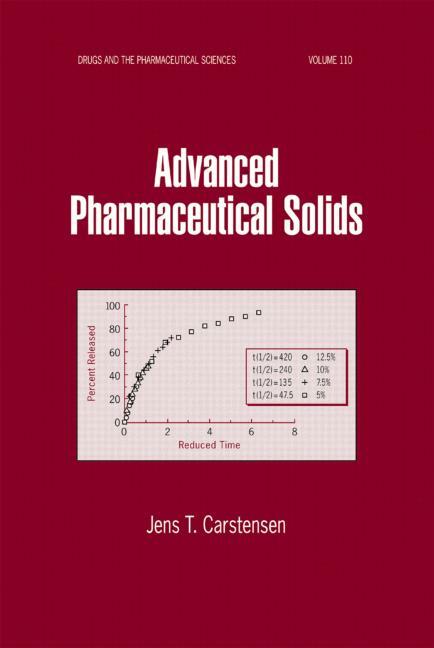 This extensive reference/text explores the principles, instrumentation, processes, and programs of pharmaceutical solid science as well as new aspects on one-component systems, micromeritics, polymorphism, solid-state stability, cohesion, powder flow, blending, single- unit sustained release, and tablet coating. Reveals unique approaches in pharmaceutical solid science not previously published in any other text! Considering properties of solids, permeamitry and gas absorption methods, amorphates, and purification by pH-change precipitation, Advanced Pharmaceutical Solids is an essential reference for pharmacists; pharmaceutical scientists; medicinal, physical, surface, colloid, and analytical chemists and biochemists; and an effective text for upper-level undergraduate and graduate students in these disciplines.